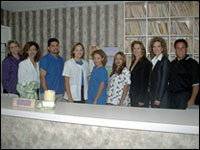 We have office hours in the morning and afternoon that are reserved for New Patients. We do this so that the patient has uninterrupted time to speak with the doctor. Examination and/or x-rays are done during these times. The doctor also uses these time frames to have uninterrupted time to review any tests and/or x-ray findings with patients. Any questions the patient may have regarding treatment recommendations, as well as any and all concerns are addressed during these reserved time frames. Convenient location, handicap access, close to transit drop off. Modern x-ray/radiographic facility on site.